It was under this playwright and satirist, who had some skill as a soldier, that the British cause now received a blow from which it never recovered. Burgoyne had taken part in driving the Americans from Canada in 1776 and had spent the following winter in England using his influence to secure an independent command. To his later undoing he succeeded. It was he, and not, as had been expected, General Carleton, who was appointed to lead the expedition of 1777 from Canada to the Hudson. Burgoyne was given instructions so rigid as to be an insult to his intelligence. He was to do one thing and only one thing, to press forward to the Hudson and meet Howe. At the same time Lord George Germain, the minister responsible, failed to instruct Howe to advance up the Hudson to meet Burgoyne. Burgoyne had a genuine belief in the wisdom of this strategy but he had no power to vary it, to meet changing circumstances, and this was one chief factor in his failure. Behold Burgoyne then, on the 17th of June, embarking on Lake Champlain the army which, ever since his arrival in Canada on the 6th of May, he had been preparing for this advance. He had rather more than seven thousand men, of whom nearly one-half were Germans under the competent General Riedesel. In the force of Burgoyne we find the ominous presence of some hundreds of Indian allies. They had been attached to one side or the other in every war fought in those regions during the previous one hundred and fifty years. In the war which ended in 1763 Montcalm had used them and so had his opponent Amherst. The regiments from the New England and other colonies had fought in alliance with the painted and befeathered savages and had made no protest. Now either times had changed, or there was something in a civil war which made the use of savages seem hideous. One thing is certain. Amherst had held his savages in stern restraint and could say proudly that they had not committed a single outrage. Burgoyne was not so happy. In nearly every war the professional soldier shows distrust, if not contempt, for civilian levies. Burgoyne had been in America before the day of Bunker Hill and knew a great deal about the country. He thought the “insurgents” good enough fighters when protected by trees and stones and swampy ground. But he thought, too, that they had no real knowledge of the science of war and could not fight a pitched battle. He himself had not shown the prevision required by sound military knowledge. If the British were going to abandon the advantage of sea power and fight where they could not fall back on their fleet, they needed to pay special attention to land transport. This Burgoyne had not done. It was only a little more than a week before he reached Lake Champlain that he asked Carleton to provide the four hundred horses and five hundred carts which he still needed and which were not easily secured in a sparsely settled country. Burgoyne lingered for three days at Crown Point, half way down the lake. Then, on the 2d of July, he laid siege to Fort Ticonderoga. Once past this fort, guarding the route to Lake George, he could easily reach the Hudson. In command at Fort Ticonderoga was General St. Clair, with about thirty-five hundred men. He had long notice of the siege, for the expedition of Burgoyne had been the open talk of Montreal and the surrounding country during many months. He had built Fort Independence, on the east shore of Lake Champlain, and with a great expenditure of labor had sunk twenty-two piers across the lake and stretched in front of them a boom to protect the two forts. But he had neglected to defend Sugar Hill in front of Fort Ticonderoga, and commanding the American works. It took only three or four days for the British to drag cannon to the top, erect a battery and prepare to open fire. On the 5th of July, St. Clair had to face a bitter necessity. He abandoned the untenable forts and retired southward to Fort Edward by way of the difficult Green Mountains. The British took one hundred and twenty-eight guns. These successes led the British to think that within a few days they would be in Albany. We have an amusing picture of the effect on George III of the fall of Fort Ticonderoga. The place had been much discussed. It had been the first British fort to fall to the Americans when the Revolution began, and Carleton’s failure to take it in the autumn of 1776 had been the cause of acute heartburning in London. Now, when the news of its fall reached England, George III burst into the Queen’s room with the glad cry, “I have beat them, I have beat the Americans.” Washington’s depression was not as great as the King’s elation; he had a better sense of values; but he had intended that the fort should hold Burgoyne, and its fall was a disastrous blow. The Americans showed skill and good soldierly quality in the retreat from Ticonderoga, and Burgoyne in following and harassing them was led into hard fighting in the woods. The easier route by way of Lake George was open but Burgoyne hoped to destroy his enemy by direct pursuit through the forest. It took him twenty days to hew his way twenty miles, to the upper waters of the Hudson near Fort Edward. When there on the 30th of July he had communications open from the Hudson to the St. Lawrence. Fortune seemed to smile on Burgoyne. He had taken many guns and he had proved the fighting quality of his men. But his cheerful elation had, in truth, no sound basis. Never during the two and a half months of bitter struggle which followed was he able to advance more than twenty-five miles from Fort Edward. The moment he needed transport by land he found himself almost helpless. Sometimes his men were without food and equipment because he had not the horses and carts to bring supplies from the head of water at Fort Anne or Fort George, a score of miles away. Sometimes he had no food to transport. He was dependent on his communications for every form of supplies. Even hay had to be brought from Canada, since, in the forest country, there was little food for his horses. The perennial problem for the British in all operations was this one of food. The inland regions were too sparsely populated to make it possible for more than a few soldiers to live on local supplies. The wheat for the bread of the British soldier, his beef and his pork, even the oats for his horse, came, for the most part, from England, at vast expense for transport, which made fortunes for contractors. It is said that the cost of a pound of salted meat delivered to Burgoyne on the Hudson was thirty shillings. Burgoyne had been told that the inhabitants needed only protection to make them openly loyal and had counted on them for supplies. He found instead the great mass of the people hostile and he doubted the sincerity even of those who professed their loyalty. After Burgoyne had been a month at Fort Edward he was face to face with starvation. If he advanced he lengthened his line to flank attack. As it was he had difficulty in holding it against New Englanders, the most resolute of all his foes, eager to assert by hard fighting, if need be, their right to hold the invaded territory which was claimed also by New York. Burgoyne’s instructions forbade him to turn aside and strike them a heavy blow. He must go on to meet Howe who was not there to be met. A being who could see the movements of men as we watch a game of chess, might think that madness had seized the British leaders; Burgoyne on the upper Hudson plunging forward resolutely to meet Howe; Howe at sea sailing away, as it might well seem, to get as far from Burgoyne as he could; Clinton in command at New York without instructions, puzzled what to do and not hearing from his leader, Howe, for six weeks at a time; and across the sea a complacent minister, Germain, who believed that he knew what to do in a scene three thousand miles away, and had drawn up exact instructions as to the way of doing it, and who was now eagerly awaiting news of the final triumph. Burgoyne did his best. Early in August he had to make a venturesome stroke to get sorely needed food. Some twenty-five miles east of the Hudson at Bennington, in difficult country, New England militia had gathered food and munitions, and horses for transport. The pressure of need clouded Burgoyne’s judgment. To make a dash for Bennington meant a long and dangerous march. He was assured, however, that a surprise was possible and that in any case the country was full of friends only awaiting a little encouragement to come out openly on his side. They were Germans who lay on Burgoyne’s left and Burgoyne sent Colonel Baum, an efficient officer, with five or six hundred men to attack the New Englanders and bring in the supplies. It was a stupid blunder to send Germans among a people specially incensed against the use of these mercenaries. There was no surprise. Many professing loyalists, seemingly eager to take the oath of allegiance, met and delayed Baum. When near Bennington he found in front of him a force barring the way and had to make a carefully guarded camp for the night. Then five hundred men, some of them the cheerful takers of the oath of allegiance, slipped round to his rear and in the morning he was attacked from front and rear. A hot fight followed which resulted in the complete defeat of the British. Baum was mortally wounded. Some of his men escaped into the woods; the rest were killed or captured. Nor was this all. Burgoyne, scenting danger, had ordered five hundred more Germans to reinforce Baum. They, too, were attacked and overwhelmed. In all Burgoyne lost some eight hundred men and four guns. The American loss was seventy. It shows the spirit of the time that, for the sport of the soldiers, British prisoners were tied together in pairs and driven by negroes at the tail of horses. An American soldier described long after, with regret for his own cruelty, how he had taken a British prisoner who had had his left eye shot out and mounted him on a horse also without the left eye, in derision at the captive’s misfortune. The British complained that quarter was refused in the fight. For days tired stragglers, after long wandering in the woods, drifted into Burgoyne’s camp. This was now near Saratoga, a name destined to be ominous in the history of the British army. Further misfortune now crowded upon Burgoyne. The general of that day had two favorite forms of attack. One was to hold the enemy’s front and throw out a column to march round the flank and attack his rear, the method of Howe at the Brandywine; the other method was to advance on the enemy by lines converging at a common center. This form of attack had proved most successful eighteen years earlier when the British had finally secured Canada by bringing together, at Montreal, three armies, one from the east, one from the west, and one from the south. Now there was a similar plan of bringing together three British forces at or near Albany, on the Hudson. Of Clinton, at New York, and Burgoyne we know. The third force was under General St. Leger. With some seventeen hundred men, fully half of whom were Indians, he had gone up the St. Lawrence from Montreal and was advancing from Oswego on Lake Ontario to attack Fort Stanwix at the end of the road from the Great Lakes to the Mohawk River. 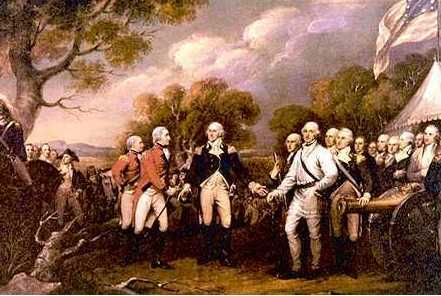 After taking that stronghold he intended to go down the river valley to meet Burgoyne near Albany. On the 3d of August St. Leger was before Fort Stanwix garrisoned by some seven hundred Americans. With him were two men deemed potent in that scene. One of these was Sir John Johnson who had recently inherited the vast estate in the neighborhood of his father, the great Indian Superintendent, Sir William Johnson, and was now in command of a regiment recruited from Loyalists, many of them fierce and embittered because of the seizure of their property. The other leader was a famous chief of the Mohawks, Thayendanegea, or, to give him his English name, Joseph Brant, half savage still, but also half civilized and half educated, because he had had a careful schooling and for a brief day had been courted by London fashion. He exerted a formidable influence with his own people. The Indians were not, however, all on one side. Half of the six tribes of the Iroquois were either neutral or in sympathy with the Americans. Among the savages, as among the civilized, the war was a family quarrel, in which brother fought brother. Most of the Indians on the American side preserved, indeed, an outward neutrality. There was no hostile population for them to plunder and the Indian usually had no stomach for any other kind of warfare. The allies of the British, on the other hand, had plenty of openings to their taste and they brought on the British cause an enduring discredit. When St. Leger was before Fort Stanwix he heard that a force of eight hundred men, led by a German settler named Herkimer, was coming up against him. When it was at Oriskany, about six miles away, St. Leger laid a trap. He sent Brant with some hundreds of Indians and a few soldiers to be concealed in a marshy ravine which Herkimer must cross. When the American force was hemmed in by trees and marsh on the narrow causeway of logs running across the ravine the Indians attacked with wild yells and murderous fire. Then followed a bloody hand to hand fight. Tradition has been busy with its horrors. Men struggled in slime and blood and shouted curses and defiance. Improbable stories are told of pairs of skeletons found afterwards in the bog each with a bony hand which had driven a knife to the heart of the other. In the end the British, met by resolution so fierce, drew back. Meanwhile a sortie from the American fort on their rear had a menacing success. Sir John Johnson’s camp was taken and sacked. The two sides were at last glad to separate, after the most bloody struggle in the whole war. St. Leger’s Indians had had more than enough. About a hundred had been killed and the rest were in a state of mutiny. Soon it was known that Benedict Arnold, with a considerable force, was pushing up the Mohawk Valley to relieve the American fort. Arnold knew how to deal with savages. He took care that his friendly Indians should come into contact with those of Brant and tell lurid tales of utter disaster to Burgoyne and of a great avenging army on the march to attack St. Leger. The result was that St. Leger’s Indians broke out in riot and maddened themselves with stolen rum. Disorder affected even the soldiers. The only thing for St. Leger to do was to get away. He abandoned his guns and stores and, harassed now by his former Indian allies, made his way to Oswego and in the end reached Montreal with a remnant of his force. News of these things came to Burgoyne just after the disaster at Bennington. Since Fort Stanwix was in a country counted upon as Loyalist at heart it was especially discouraging again to find that in the main the population was against the British. During the war almost without exception Loyalist opinion proved weak against the fierce determination of the American side. It was partly a matter of organization. The vigilance committees in each State made life well-nigh intolerable to suspected Tories. Above all, however, the British had to bear the odium which attaches always to the invader. We do not know what an American army would have done if, with Iroquois savages as allies, it had made war in an English county. We know what loathing a parallel situation aroused against the British army in America. The Indians, it should be noted, were not soldiers under British discipline but allies; the chiefs regarded themselves as equals who must be consulted and not as enlisted to take orders from a British general.